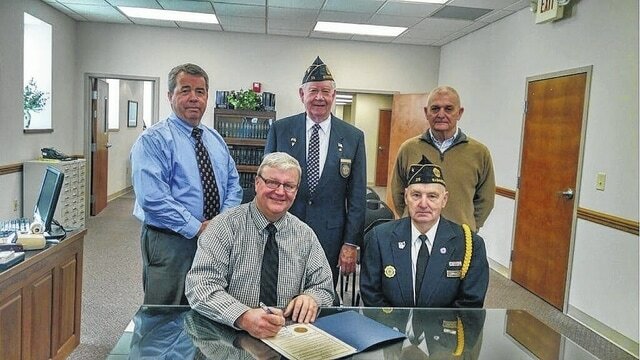 The Fayette County Commissioners signed a proclamation Tuesday commemorating “Four Chaplains Sunday.” Seated are Fayette County Commissioner Chairman Dan Dean and American Legion Post 25 Commander David Frederick. Standing from left to right are Commissioner Tony Anderson, Four Chaplains Program Chair Edward Helt, and Commissioner Vice Chair Jack DeWeese. The Fayette County Commissioners signed a proclamation Tuesday designating Sunday, Feb. 5 as “Four Chaplains Sunday” to mark the 74th anniversary of the sinking of the troopship Dorchester, which carried to their deaths four chaplains of three faiths who stood united in prayer as the ship went down. Paul H. Hughey American Legion Post 25 will join other Legion posts around the nation to commemorate the sinking of the American troopship on Feb. 3, 1943 during World War II, according to Ed Helt, chairman of the Four Chaplains Sunday event for the Post. “The event itself was not an uncommon one, however the actions taken by four chaplains who were aboard the ship set it far above the others, as witnessed by many of the survivors,” said Helt. According to accounts, these four chaplains – a Jewish rabbi, a Roman Catholic priest, and two Protestant ministers – calmly issued life belts to those servicemen who survived the exploding torpedo and the flooding decks so that they might have a chance as they entered the icy water, just short of their destination of Greenland. When there were no more to give, the chaplains gave up their own life belts so that four servicemen would not be without one. Those in the lifeboats had a view of the chaplains on the slanted deck with arms linked, voices raised in prayer, as the converted freighter slid beneath the cold waters. These four chaplains, of different faiths, had a common bond in their service to God and mankind. “A service they portrayed to the fullest in giving up their lives for another human being,” said Helt. On Sunday, Feb. 5, members of the Fayette County Honor Guard and the Veterans’ Posts in Fayette County are invited to join the officers, members, Ladies Auxiliary and Sons of the American Legion of Post 25 at the 10:45 a.m. worship service at the Fayette Bible Church, 1315 Dayton Ave. in Washington C.H. American Legion Post 25 Commander Dave Frederick encourages the attendance of those invited to the annual event. Helt said, “It is quite appropriate that this wonderful event be perpetuated and we appreciate the Fayette Bible Church and all the other local churches that have served as host over the years.” Helt also said that Glenn Rankin, a member of A.L. Post 25 executive committee, who also serves as the scout master of Jeffersonville Boy Scout Troop No. 67, will attend with officers and members of the troop. Tony Garren, Fayette Bible Church pastor, also welcomes all the special visitors to the Feb. 5 morning worship service. https://www.recordherald.com/wp-content/uploads/sites/27/2017/01/web1_FourChaplain.jpgThe Fayette County Commissioners signed a proclamation Tuesday commemorating “Four Chaplains Sunday.” Seated are Fayette County Commissioner Chairman Dan Dean and American Legion Post 25 Commander David Frederick. Standing from left to right are Commissioner Tony Anderson, Four Chaplains Program Chair Edward Helt, and Commissioner Vice Chair Jack DeWeese.